Two years ago in 2009, visionaries and leaders gathered to envision bringing 100% Rockwell to Ortigas. Now, Rockwell Land is proud to unveil the finished structures of The Groves first two towers against the Ortigas horizon as it topped off Towers A and B last October 28 and a celebration marked the occasion on November 25, 2011. The festivity on a bright Friday afternoon was graced by none other than Chairman Emeritus Oscar Lopez and Rockwell Land Chairman Manolo Lopez themselves, where they bravely rode the Alimak (construction elevator) to the highest peak of the buildings. The anticipation was more palpable as it was evident that construction was in full swing and on time definitely stirring up excitement with unit owners and investors who look forward to the towers turn-over in June 2012. Over 300 attendees, those which included Lopez and Rockwell members of the board and executives, unit owners and clients, were serenaded by the Vince Lahoras saxophone, which played familiar holiday tunes. Free flowing wine, scrumptious hors d doerves by Bizu complemented the excited chatter of guests which last lasted till about 8:00 PM. We are very excited to bring The Rockwell Lifestyle to the Ortigas area. Now that all 24 floors of Towers A and B are up, it is even more thrilling as we literally see a piece of Rockwell amidst the Ortigas skyline, said Valerie Soliven, VP of Sales and Marketing. With four more towers to go, all we can do is watch with bated breath as Rockwell redefines the Ortigas skyline. 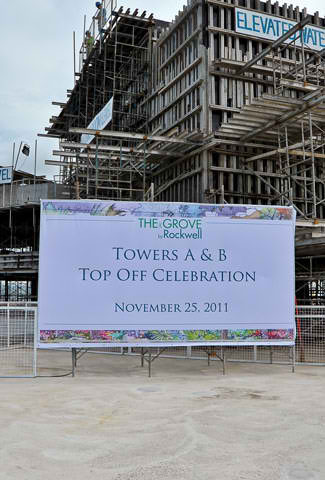 The Grove is yet another Rockwell development set to make its mark, take its place and further elevate the bustling Ortigas area. Situated along E. Rodriguez Jr. Avenue, The Grove by Rockwell is set to cater to more people who desire 100% Rockwell from the first Makati development. The Rockwell Lifestyle has been continuously achieved through the creation of secure, exclusive and relaxing communities through top notch developments designed with the utmost attention to detail and international standards.